People have a continuing fascination with giants. Part of the attraction of dinosaurs is their great size, the largest over 100 feet in length and 100 tons or more in weight. Many groups of plants and animals other than dinosaurs achieved gigantism sometime in their evolutionary history (lycopod plants, scorpions, rhinoceroses, and varanoid lizards among others). However, not all giants are of absolutely large size. Being crowned a “giant” depends on how large the other members of your group are. There are several forces that drive the evolution of gigantism -- anatomy, mechanical constraints, and environment to name just a few. 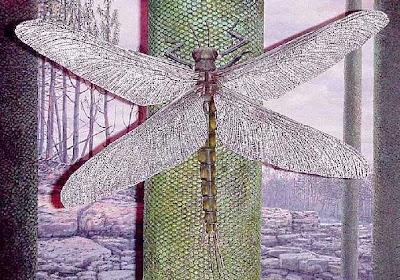 One of the more interesting giants in the fossil record, and one with some pop culture significance, are the giant dragonflies of the Paleozoic. Dragonflies (Order Odonata) are among the most recognizable groups of living insects. They are large, often brightly colored, active during the day, and quite visible flying around and resting in open areas. Among the insects, dragonflies have devoted human observers, the arthropod equivalent of bird watching. 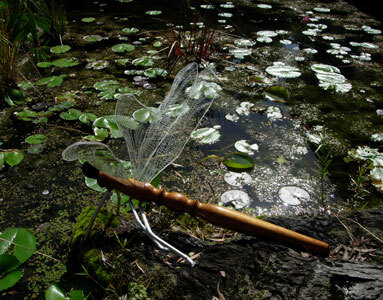 With at least 6000 known living species there are plenty of dragonflies to watch. All dragonflies are predators and most are highly agile aerial predators. One exception is the damselfly family Pseudostigmatidae, which hunts orb-weaving spiders and plucks them from their webs! 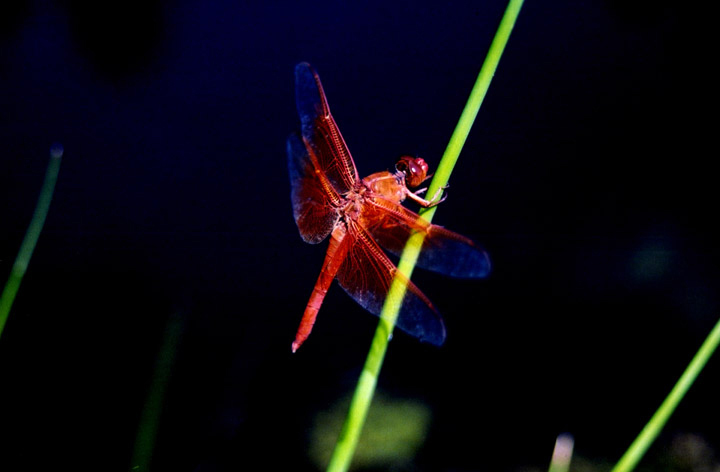 Dragonflies can fly at speeds up to 35 miles an hour chasing prey or hover motionless over a pond. They can even fly backwards! Their large spherical eyes, covering most of their head, provide excellent vision for hunting prey --- mostly small flying insects (especially mosquitos) – by flying, catching them between their legs,and eating them on the run. Although they may live several years as an aquatic nymph, flying adults have a short life of between one and six months. The nymphs of dragonflies are also voracious predators. In some species the nymph captures, kills,and eats tadpoles and small fish! As we’ll see later, this has some interesting implications for griffenflies. 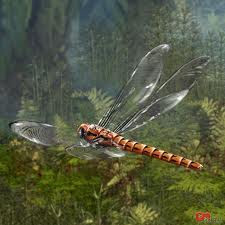 Dragonflies have a long evolutionary history, extending back some 300 million years to the Carboniferous Period. 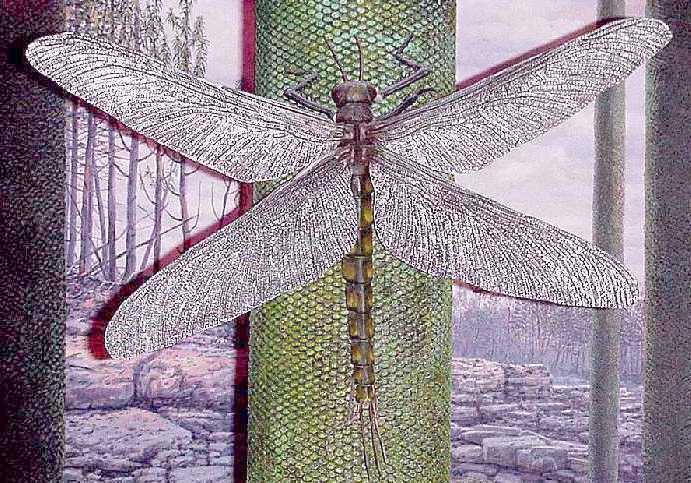 Technically speaking these ancient giants are not true dragonflies but rather the closest relatives of dragonflies. That need not worry us very much as the distinction is based on detailed anatomical and evolutionary analysis and is, in part, purely definitional. They are known scientifically as protodonata, meganeuridae, meganisopterans, or griffenflies. Here I’ll use griffenflies. I’m not sure of the etymology of that name, but in German "griffen" means “attack” – resulting in an appropriate nomen. When you step on a cockroach, there is a pleasing crunchy sound, made by the compressing and cracking of the hard exoskeleton. However, the exoskeleton of insects is not always hard and not all parts are equally hard. 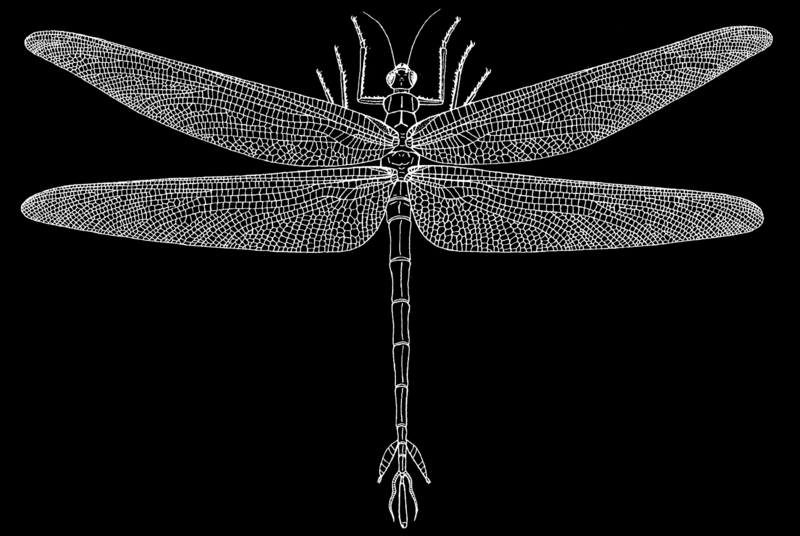 In dragonflies it is the wings that are the most resilient body part and the part most likely to be fossilized. 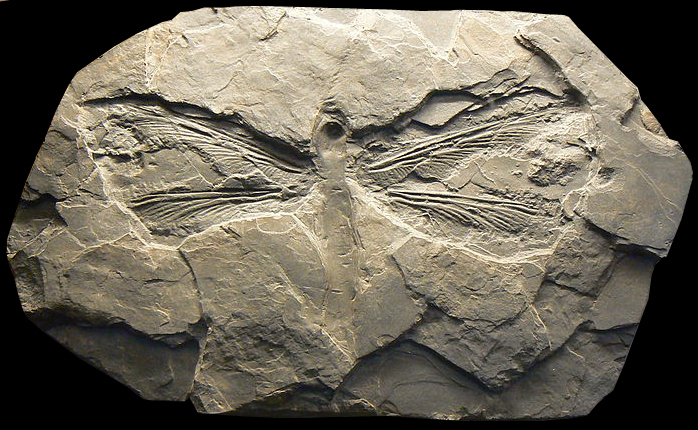 So, much of the fossil record of griffenflies consists of fragmentary specimens, with a few spectacular exceptions. Griffenflies darted through the Earth’s skies for some 20+ million years million years (Late Carboniferous 317 MYA – Late Permian 247 MYA) and achieved a worldwide distribution. There are a few complete or nearly complete griffenflies that provide much information about the overall anatomy of the group (1, 2). They have large, robust, toothed “jaws”, large spheroidal compound eyes, and strong legs with large spines. Their wings are large, strong, and directed sideways from the body. All these are dragonfly adaptations for aerial predation and griffenflies clearly had a similar lifestyle. 7. An unidentified, but spectacularly complete, griffenfly from France. Griffenflies achieved a wide distribution, were fairly diverse (3), and new species continue to be described every year. 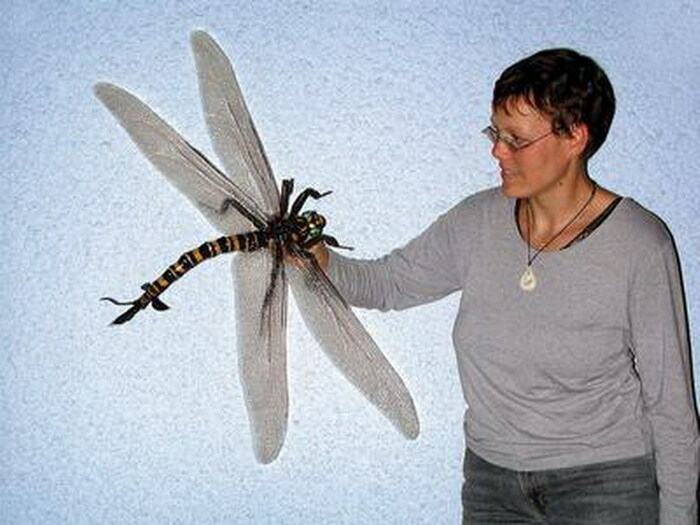 While most griffenflies are large, some are within the size range of modern dragonflies. However, some are truly gigantic by insect, and especially dragonfly, standards. 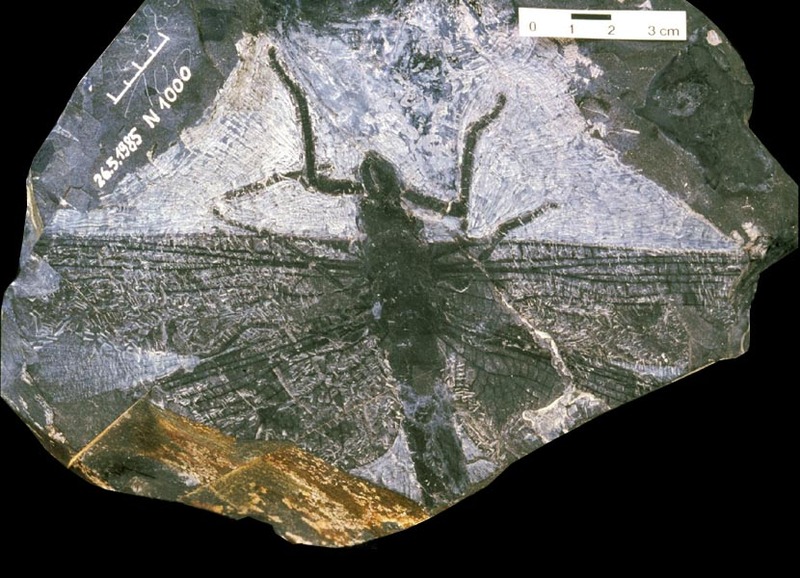 Meganeura monyi,the first described griffenfly, was based only a fossil wing about 12 inches long and an estimate wing span of 27 inches (including an estimated body width between the wings). At the time of its description in 1895 it was the largest insect known and remained so until 1939 (4), when Frank Carpenter described Meganeuropsis permiana from Kansas. M.permiana was based on an incomplete, but large wing, in two parts. Scaling the wing of M. monyi up to the size of M. permiana, Carpenter estimated a wingspan of 29 inches for his new species. Several years later, Carpenter described another new species of griffenfly, Meganeuropsis americana (5). 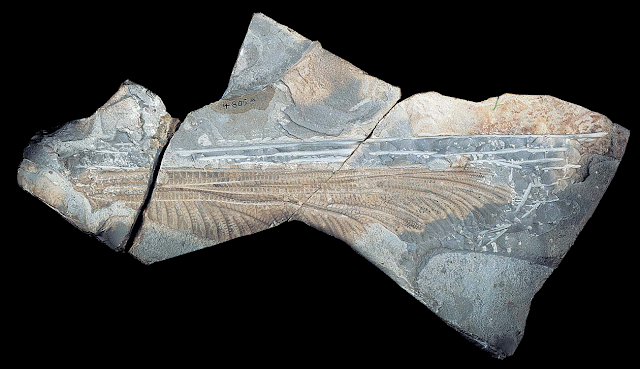 This species is based on a spectacular specimen the largest complete wing ever found. He estimated the wingspan of M. americana as close to that of M. permiana. The spectacular M. americana wing is on permanent exhibit at the Museum of Comparative Zoology at Harvard University. Today, specialists consider the two species of Meganeuopsis to be the same and the correct name is M. permiana. It is this species that holds the record as the largest known insect (6). Compare this to Megaloprepus coerulatus, the living odonate with the largest wingspan --- a paltry 7.5 inches. 9. The wing of the giant Meganuropsis permiana, measuring a remarkable 13 inches! 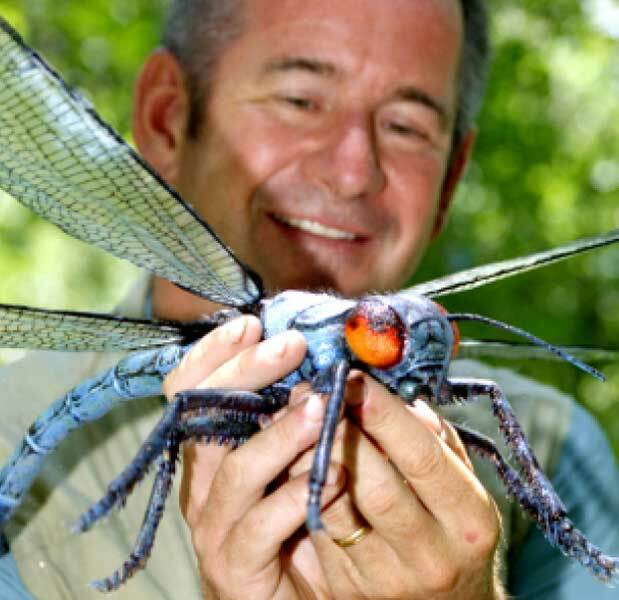 A 29 inch wing span is damn big for an insect --- but not big enough for some. Although often repeated in the popular press, websites, and books, griffenflies NEVER achieved wingspans of FIVE or SIX feet. There is absolutely no evidence for that and such a size is almost certainly above the mechanical capabilities of the insect exoskeleton, especially for flight. Nevertheless the myth continues to be repeated as though it were a well established fact. Is it possible that the known specimens of M. permiana are not full adult size and the species grew even larger? We can answer that question definitively NO. We can do that because of the biology of dragonflies. The predatory nymph stage of dragonflies grows for months or years in lakes and streams, shedding its exoskeleton several times. However, once the nymph crawls out of the water, sheds its exoskeleton a final time, and emerges as an adult, growth ceases. So a dragonfly wing in the fossil record is of adult size. Griffenflies had a similar biology and so known wings are of fixed adult size. This fact provides some interesting insight into griffenfly diversity. In the Permian rocks of the Lodeve Basin griffenfly wings can be grouped into five distinct size classes. Given how they grew, these must represent five different species (7). Estimates of body length for the largest species of griffenflies, some of which are known from more than just wings, is about 17 inches. 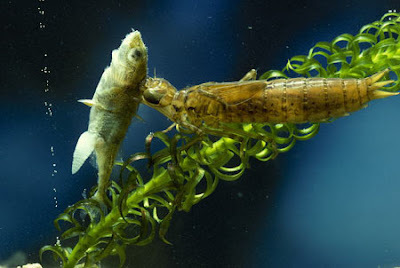 This means that the nymphs reached a length of 17 inches and must have been major predators in freshwater systems, likely feeding on amphibians as well and fish and smaller creatures. 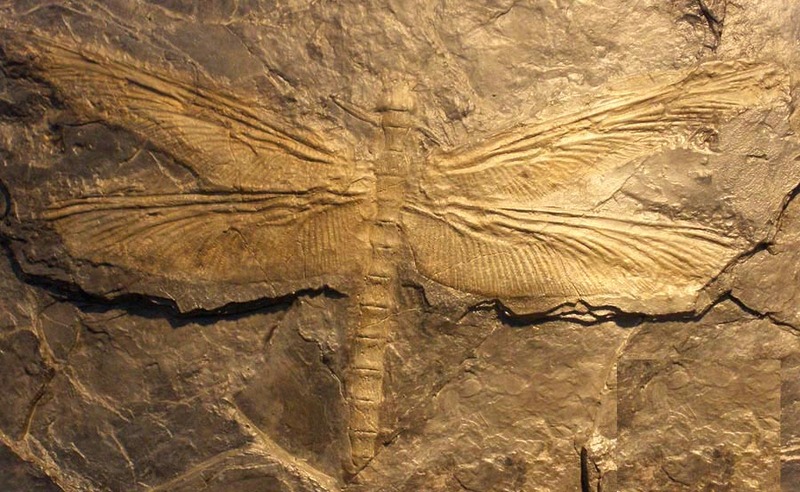 Griffenflies may have been extinct for 250,000,000 years but one might well ask why are there no equally gigantic dragonflies in today’s world? 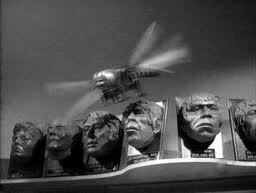 Or to turn the question around, what allowed griffenflies to attain their great size? The Late Paleozoic was unusual in several ways. During the Late Carboniferous and Early Permian there were extensive coal swamp forests that generated tremendous amounts of oxygen as a byproduct of photosynthesis. This created a hyperoxic atmosphere, with oxygen levels in excess of modern levels. Insects lack lungs and breath through a series of tubes (trachea) that are connected to the outside. Oxygen is absorbed through the wall of these tubes by simple diffusion. With higher oxygen levels in the atmosphere the amount of the gas absorbs increases and that increased absorption would allow insects to evolve giant body size. The anatomy of griffenflies indicates very maneuverable flight capabilities which would be very demanding metabolically and require high oxygen levels. Decreasing oxygen levels in the Permian, coupled with a much more arid global aridity, could have driven these giants to extinction. Modern atmospheric oxygen levels may be too low to allow gigantism in active aerial predatory insects (8). Of course, when griffenflies ruled the air they really ruled the air. Flying vertebrates, birds, bats, and pterosaurs, would not evolve for at least another 100,000,000 years, so the skies were free of more active fliers that might have preyed on griffenflies. Dr. Blake: Do you know anything about paleontology? 11. Meganuera (with caveman restorations behind it) getting ready to attack students and faculty in Monster On The Campus. Meganeura makes continual appearances in scientific programs and museum exhibits. It appears, much better animated this time, in the BBC documentary Walking with Monsters, episode 2 in which it flies and ultimately steals a small reptile from a large spider. Meganeura also appeared the episode entitled The Bug House in ITVs six part Prehistoric Park. 13. 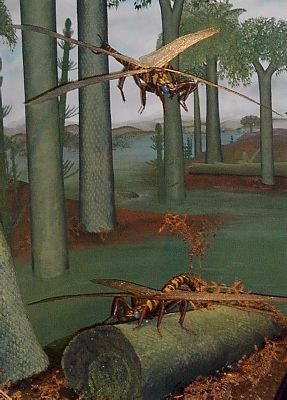 Restoration of flying and resting griffenflies in a coal swamp diorama in the Naturkundmuseum, Stuttgart. 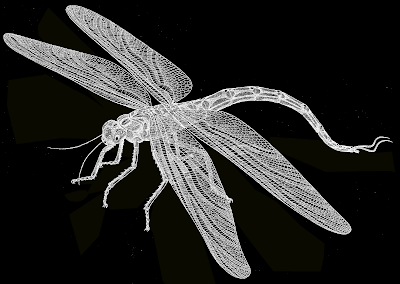 Tania Summerell is an Australian multi-media visual artist who created a timber, acrylic perspex, plastic, and aluminum artistic rendition of Meganeura as part of her Living Fossils exhibit, which addresses issues of biotic conservation. Robin Tillyard (1881-1937) was an accomplished and eminent English – Australian entomologist who worked on both living and fossil insects. He wrote extensively on the Permian insect beds of Kansas, including the griffenflies, before Chapman discovered the giants there. In addition to his many scientific papers, in 1917 he wrote The Biology of Dragonflies and in 1926 he published the authoritative The Insects of Australia and New Zealand, which remained a standard work for a half century (9). 17. Entomologist and paleo-occulist Robin Tillyard. However, Tillyard had some mighty peculiar interests outside of insects. In modern parlance one might say he was “complicated.” He was deeply interested in the occult. After a séance with the psychic Mina Stinson (a séance which later proved to be a hoax)Tillyard became convinced of the survival of the human personality after death. In 1928 he somehow managed to get his findings published in the august scientific journal Nature. Unfortunately, his occult interests did not help him much. In 1928 the psychic Jeanne Laplace “predicted” Tillyard’s death in a motor accident and this prediction was sent to Tillyard. Tillyard’s reaction? He merely laughed at the whole affair, remarking that this type of prognostication is so seldom verified.” Maybe so, but Tillyard did indeed died in a car accident in Australia on Jan 13, 1937. Ironically, Tillyards’ daughter, Faith Evans, died on March 22, 2005 after being hit by a car (10). Reincarnating the fossil griffenflies is certainly an odd idea, but not the oddest of ideas about these magnificent insects. Stace Tussel claims he had a “giant dragonfly encounter in eastern Kansas” in the 1960s (11). There on I-35 he saw a living giant dragonfly with a wingspan that could have been 5 feet. He thought this might have been the result of “experiencing a meta-dimension” or moving backwards and forwards in time. He couldn’t decide if the griffenfly exists in a parallel dimension or lives a hidden life on our planet. I live in the rural hamlet of Jensen, Utah and the bottom lands of the nearby Green River flood every Spring, some years worse than others. Regardless of the level of flooding, however, this area is famous as the mosquito factory for the state, with literally billions of those pesky West Nile Virus carrying dipterans swarming the skies. So if any readers see a living griffenfly, please let me know. We could sure use them here. (1) Bechly, G., Brauckmann, C., Zessin, W., and Ning, E.G.2001. 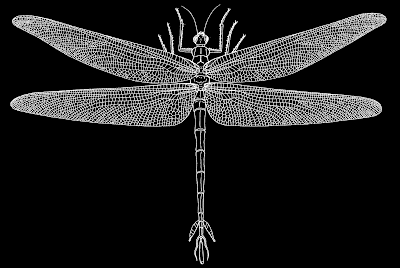 New results concerning the morphology of the most ancient dragonflies (Insecta: Odonatoptera) from the Namurian of Hagen-Vorhalle (Germany).J. Zool. Syst. Evol. Research 39 (2001) 209-226. (2) Grimaldi, D. and Engel, M.S. 2005. Evolution of the Insects. Cambridge University Press: 755 pp. (5) Carpenter, F.M. 1947. Lower Permian Insects from Oklahoma. Part 1.Introduction and the Orders Megasecoptera,Protodonata, and Odonata. Proceedings of the American Academy of Arts and Sciences 76(2: 25-54. (8)Dudley, R. 1998. Atmospheric oxygen, giant Paleozoic insects and the evolution of aerial locomotor performance. J Exp Biol. 201(Pt 8): 1043-50. (10) Price, L. 2005. 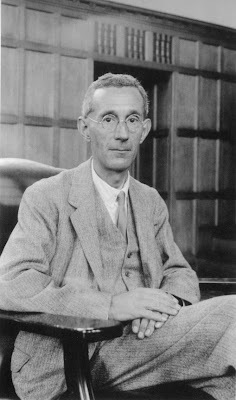 Dr. Robin John Tillyard 1881-1937- a forgotten Australian psychical researcher. Psypioneer, An Electronic Newsletter, Vol. 1,No 19. 1. The overwhelming Hall of the Bulls, the first large chamber with paintings seen by Marcel Ravidat, Jacques Marsal, Georges Agnel, and Simon Coencas after dropping through the Lascaux Cave entrance on September 12, 1940. Lascaux Cave is located along the left bank of the river Vézère near the town of Montignac in southwestern France. It is a rather short cave, only 250 meters long, with a drop of about 30 meters over that distance. The cave structure consists of a series of large circular chambers connected by passages tall enough to walk through. Archeologists have given the chambers names based on the artwork within each. 2. 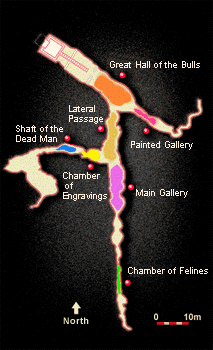 Map of the Lascaux cave with the major artistic features identified. 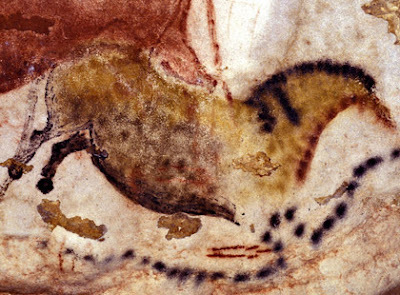 The Lascaux paintings are attributed to the Paleolithic Cro-Magnon people Homo sapiens sapiens and are part of the Magdalenian culture. 3. Animal fat was burned in this lamp to provide light in the cave. 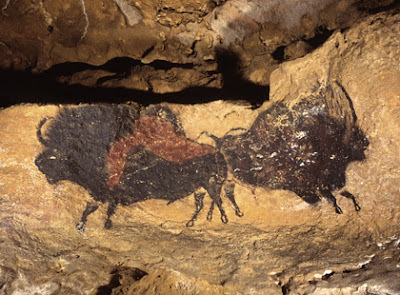 Artifacts recovered from Lascaux are mostly related to painting. Among these are rock scrapers for etching, pieces of naturally occurring pigments, pestles and mortars used to mix the pigments, bone tools, shells from necklaces, and a small bone oil lamp. 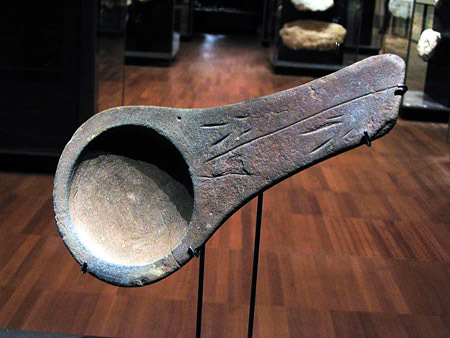 Most artifacts found are either used in painting or providing light for painting. The lack or human bones or other artifacts indicates that the cave was not used as a living site. People only used entered for painting and associated activities. 4. A shell from a necklace.It was attached to the necklace along the horizontal cut near the top. The paintings are colored with blacks, yellows, reds and whites. These pigments were created from hematitite, manganese, charcoal, and clays. The pigments were crushed, moistened with water or spit and adhered to the walls when they dried. 6. Natural pigments used in the painting. Left to right hematitie, ochre, magnesium dioxide. Outlines were made using fur or hand as a brush and fields of colors within the outline were applied by blowing the paint through a tube as seen in figure 7. 7. A horse with a row of dots below it. Lascaux contains some 2000 figures on its walls. Of these, about 600 are paintings and 1400 are engravings. These can be grouped into three groups; animals, very rare human figures, and abstract shapes. Interestingly, there are no images of landscape or vegetation anywhere in the cave. 9. Head of an auroch. Horses are by far the most common animal figure. Stags, cattle and bison are also very common. There are a few felines, two human figures, and one each of ibex, birds, bear, and rhinoceros. The few carnivores shown (felines, bears) are in the most remote parts of the cave. This beastiary reflects the large mammals occupying the area during the time of Lascaux. 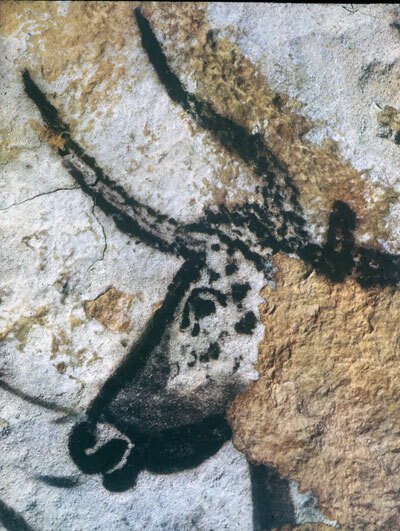 The absence of mammoths and near absence of wooly rhinoceros in Lascaux indicates that the paintings were done during a warmer interglacial period. Abstract figures occur as dots, lines, and curves, etc. and some have been interpreted as ancient star charts. What these diverse images represent is difficult to ascertain. Are they memorializing hunting events or serving as strategies for future hunts? Are the figures simply illustrations of animals or are they symbolic? Are the paintings secular or spiritual in nature? Might they serve more than one of these functions or some other function we cannot discern? These are difficult questions to answer and we may not be able to answer them at all. We know nothing of the mental and spiritual worlds of the painters so the “meaning” of the Lascaux may be impossible to answer with certainty. However, the art was not likely decorations of living areas, since the caves with paintings show no signs of continuing habitation. There is a very large body of research about cave art around the world. That is much too complex an issue to even discuss in a rudimentary way here and I suggest the interested reader search the internet for discussions of the various schools of thought interpreting the paintings. HOW OLD ARE THE PAINTINGS? Dating the Lascaux paintings themselves is frustratingly challenging. This is because most of the pigments used are metal oxides and have no carbon, thereby excluding radiocarbon dating. C14 dating of small bits of charcoal excavated from the cave floors gives dates of 15,500 to 17,2000 years old. 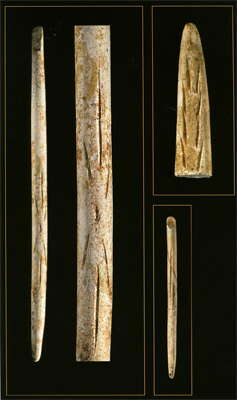 C14 dates of bone tools from the floor gives ages ranging from 18,600 and 18,900 years old. Comparison of the Lascaux images and symbols with other better dates cave art suggests that some images may before from beginning of the Magdalenian culture around 17,000 old. Some time after the paintings were completed the cave entrance collapsed, creating a sealed stable environment that preserved the delicate artwork. The Lascaux cave paintings are without a doubt one of the greatest discoveries ever made about our species’ past. Although no human remains have been recovered from the cave and relatively few artifacts have been found, the site is a most remarkable window into the world of Upper Paleolithic humans. Understanding what these paintings meant to those who made them is very difficult to discern, but the importance of the artwork is self evident. ....... and spend some time in the virtual Lascaux. This site provides a remarkable 3-D walk through tour of both levels of the cave, with close up images of many of the paintings and information about the figures. This is an exceptional website and you will leave it with an infintely better appreciation of the cave than anything I can blog. It will also help you better appreciate the tradedy of what happened at Lascaux. A pull out bar on the left side of the screen will allow you to change languages. Its somehow appropriate that a such a spectacular site have a good tale of discovery. The Lascaux discovery itself is almost unbelievable and seems to leap from a Spielberg movie. 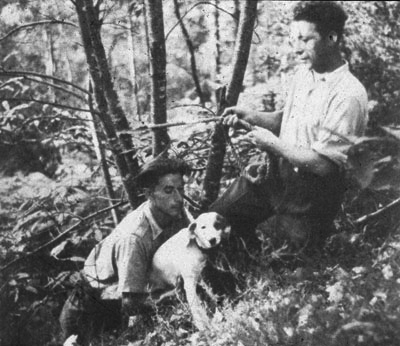 On September 12, 1940 four teenage boys, Marcel Ravidat, Jacques Marsal, Georges Agnel, and Simon Coencas, along with Marcel's dog Robot, set off to find gold riches supposedly hidden underground in the woods of Montignac. Fig 1 The dog Robot, the hero of our tale, who sniffed out the hidden entrance to Lascaux, with two of the human-co-discoverers (unidentified). In the chamber they used their small oil lamps to illuminate the cave. On the white ceiling above them they saw large red, black, and brown paintings of animals. Excitedly, the boys explored the rest of the length of the cave, seeing hundreds of animal figures by the flickering light of their lamps. At the end they came to a dark vertical shaft. With their lights running low they returned to the opening and climbed back up the shaft to daylight. Pledging secrecy, they returned the next morning, now with ropes to assist them, and re-entered the cave. They went to the end of the cave and made another frightening descent down a second, 12 meter deep, vertical shaft to a lower level with more artwork. By the third day of exploration the boys realized they couldn’t keep their discovery a secret. They agreed that each could bring five friends, but charged each one forty cents for the tour. This began the commercialization of Lascaux that would end so tragically. Of course once the tourists had seen the cave the word got out and more and more people wanted to see it. To accommodate them the discoverers further enlarged the entrance. Soon the boys went to Leon Laval, their schoolmaster, for advice. Fortunately, Laval belonged to the Montignac Prehistoric Society. 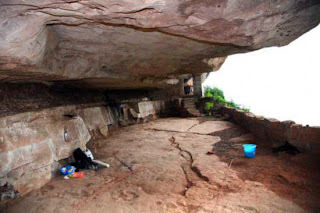 Although he was first suspect of the boy’s claims he soon went into the cave and immediately recognized the prehistoric nature of the paintings and their great scientific and cultural significance. Concerned about vandalism, Marshal pitched a tent and lived full time near the cave entrance, both protecting it and serving as its first tour guide. 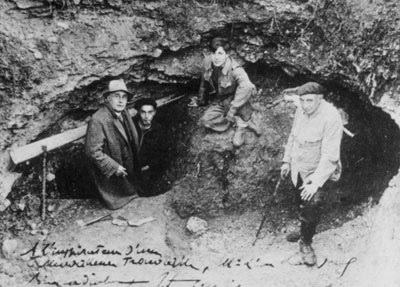 Fig 2 The 1940 visitors that established the authenticity of the Lascaux paintings, at the relatively undeveloped cave opening. 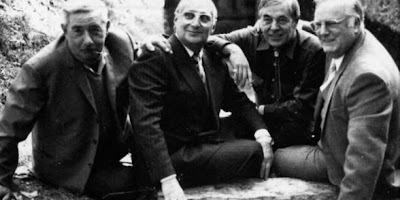 Left to right: Leon Laval, Marcel Ravidat, Jacques Marshal, and Henri Breuil. Lascaux was on the land of Count of LaRochefoucault and the family began to commercially promote visitation. Even though it was only three years after the end of the terrible devastation and dislocation of WWII, by 1948 over 1,000 people a day came to tour the cave. Although the cave was given statutory historic monument protection in December 1940, it was now on the verge of being loved to death. Fig 3 The Lascaux discoverers in 2010. Left to right: Marcel Ravidat, Simon Coencos, Jacques Marshal, and Georges Angiel. Not shown: Robot the dog (deceased). 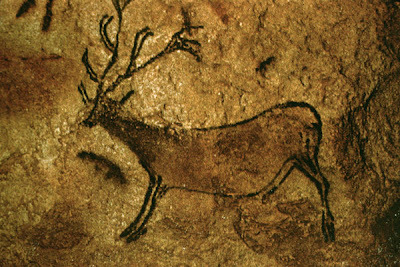 These posts about the Lascaux cave paintings were inspired by the German film maker Werner Herzog. A few weeks ago I watched his documentary film Cave of Forgotten Dreams on Netflix. It’s about the spectacular cave paintings in Chauvet Cave, itself only discovered in 1991. 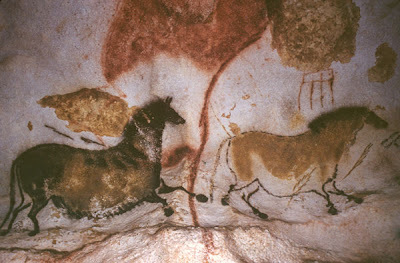 The Chauvet paintings are estimated at to be 30,000 years old, nearly that of Lascaux. There are many differences in the art between the two sites and Chauvet cave contains the remains of nearly 150 cave bears, as well as their trackways! I would suggest readers who find cave art interesting to see Cave of Forgotten Dreams. Seeing Herzog’s film reminded me of Lascaux and the problems that developed there. I knew that story only in the broadest of terms, so my new research turned up much I was unaware of. The story of Lascaux involves many themes I care deeply about and provides a most striking example of the conflicts between science, visitors, and resource protection. The precautions taken at Chauvet, as seen in Cave of Forgotten Dreams, are a direct result of the tragedy of Lascaux. I suppose that a tortoise that that went extinct nearly 200 years ago is not actually a fossil species, but being declared extinct should at least make you an honorary member of The Land Of The Dead blog. Charles Darwin studied and collected specimens during his stop at the Galapagos Islands between Sept 15 – Oct 30 1835. Darwin served as the naturalist aboard the HMS Beagle on its five year circumglobal travels. One of the striking things that Darwin noticed were the large tortoises on the islands. In fact, islands got their name “Insulae de las Galopegos” (Islands of the Tortoises) in the 18th century because of their abundance of tortoises (1). The island-to-island differences in Galapagos tortoise species helped spark Darwin’s thoughts about evolution through natural selection. 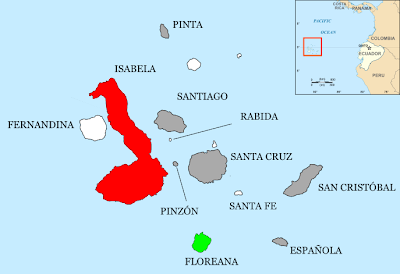 Fig 1 The Galapagos Islands. Floreana Island in green. Isabela Island in red. The Galapagos were used extensively as a stopover by pirates and whaling ships. In the first half of the 19th century some 200,000 tortoises were killed for food by the whalers. The tortoises were large, heavy (up to 880 lbs. ), and slow moving, making them an easy target. It also made them a target for extinction. Habitat destruction and the introduction of rats, pigs, etc. also contributed to their demise (2). In spite of these depredations each island still has its own living species of tortoise (with greatly reduced populations), but the species on Floreana Island, the giant Galapagos tortoise (Chelonoidis elephantopus), went extinct. It was rare when Darwin visited the Island and extinct by 1850. So it was surprising when in 2008 Nikos Polakakis and colleagues (3) reported that genetic studies of Galapagos tortoises revealed that 11 hybrid tortoises (Chelononidis becki) on Isabela Island in the Galapagos had genes from C. elephantopus. For the technically inclined, they were looking at single nucleotide polymorphisms that vary among the tortoises on different islands. This discovery provided a great opportunity. By selectively breeding individuals of C. becki having C. elephantopus genes, in about four generations (approximately 100 years) there would be individuals with about 96% of the C. elephantopus genetic markers. This would allow them to reintroduce the species to with some of its original genetic diversity back onto Floreana Island (1, 2). Fig 2 "This hurts me more than it does you." Collecting blood samples for genetic analysis. However, in a more stunning paper just published (4) Ryan Garrick and his colleagues (including Nikos Polakakis) the story becomes more remarkable. 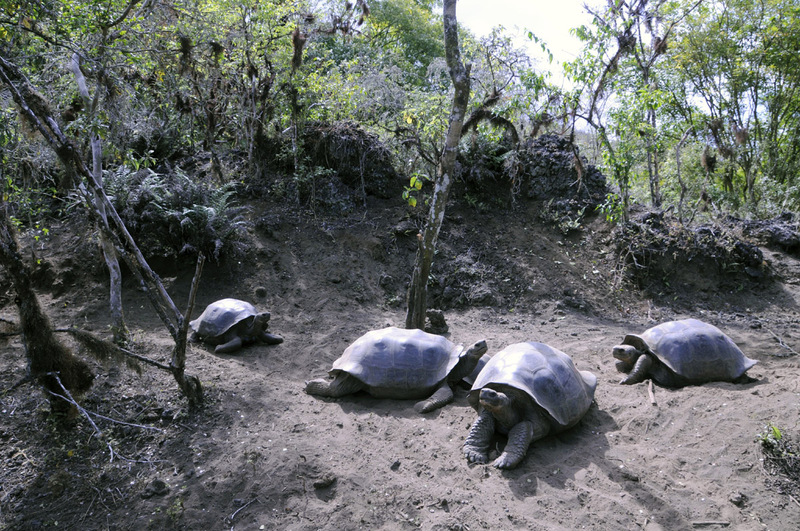 They have found that for 84 of the tested C. becki on Isabele Island, genetic analysis shows that they are the result of a hybridized breeding event that involved a purebred C. elephanoptus as one of the parents Given that 30 of these 84 these individuals are less than 15 years old and that Galapagos tortoises have lifespans of over 100 years, there is the very strong possibility that pure genetic strains of G. elephantopus are still alive and crawling around Isabela Island. The search is now underway to find those purebred individuals. Figure 3. 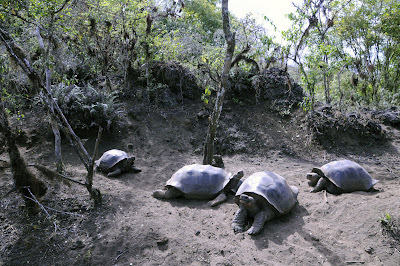 The Galapagos tortoises, by virtue of their large size and great weight, have a real impact on vegetation and erosion. Imagine thousands of such beasts per island! Their removal radically and negatively changes the island ecosystem they evolved in. Tortoises are important members of the island ecosystems and their presence, or absence, greatly influences the plants and animals on the island. Purebred C. elephantopus could be used to establish a breeding program to produce young that could be used reintroduced to Floreana Island, bringing the "extinct" tortoise back to the island it once inhabited. This is the first time that genetic tracking in hybrids has led to the rediscovery of a (thought to be) extinct species. One final question. If each Galapagos island has its own species, how did C. elephantopus get to Isabela Island? It is well known that pirates and whalers moved them. Maybe some of that was intentional, but when whalers left the Galapagos they would toss overboard any tortoises still on the ship to make room for a far more valuable cargo than meat --- whale blubber. (2) Although large, the tortoises don’t sink like stones and some of them probably made it to the shores of Isabela Island to breed amongst themselves and survive cryptically until today. (3) Pulakakis, N. et al. 2008. 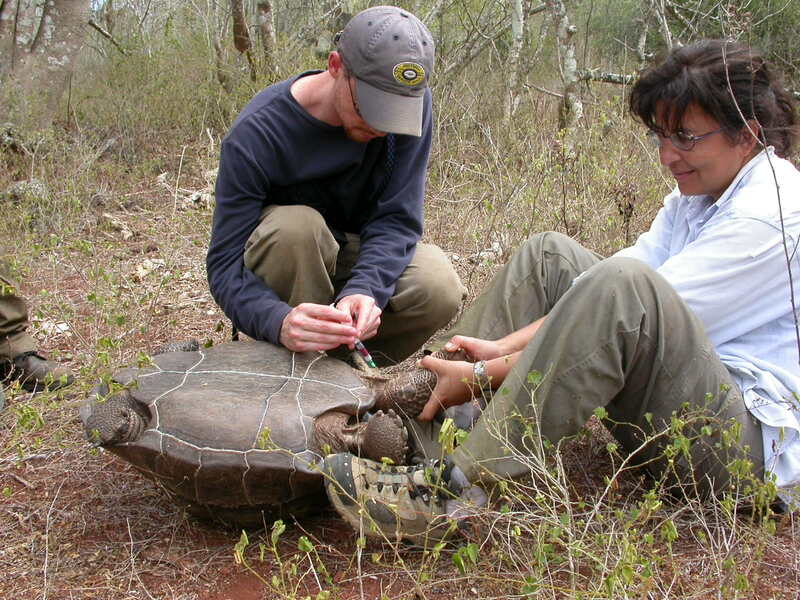 Historical DNA analysis reveals living descendants of an extinct species of Galapagos tortoise. Proceedings of the National Academy of Sciences USA 105: 15464-15469. Fig. 1 Large theropod track from the Early Jurassic. 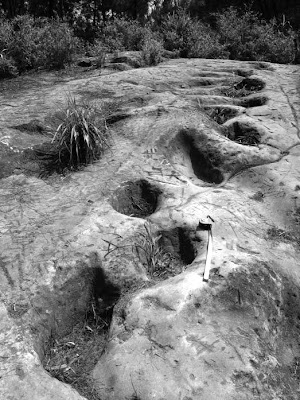 Lida Xing and his colleagues, and his colleagues Adrienne Mayor, Yu Chen, Jerry Harris, and Mike Burns, have recently published a very interesting and enlightening review of Chinese folklore as it relates to dinosaur tracks and how such myths might help in paleontological prospecting (see link at ref 2 for free pdf of this paper). The paper focuses on eight localities scattered across the country. The Chinese written record of ‘dragon bones”, (i.e. fossil bone, most often of mammals) used for medicinal purposes go back as far as the 3rd century BC. However, fossil bone is more transient because it is fragile and easily destroyed by erosion. 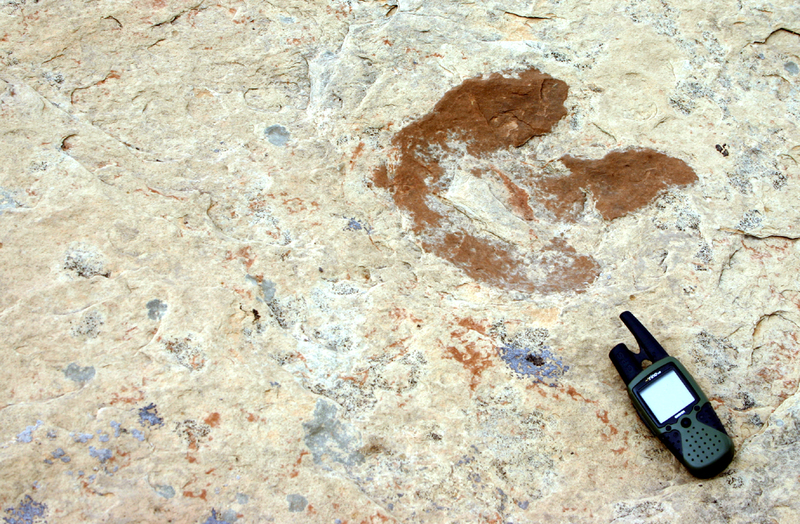 Fossil footprints are often less susceptible to such damage and are often visible in large numbers on extensive surface exposures. The authors suggest that because of this difference fossil tracksites can remain exposed for long periods of time and be seen by many generations of people. Hence it is not surprising that myths would arise in prescientific cultures to explain these striking features. 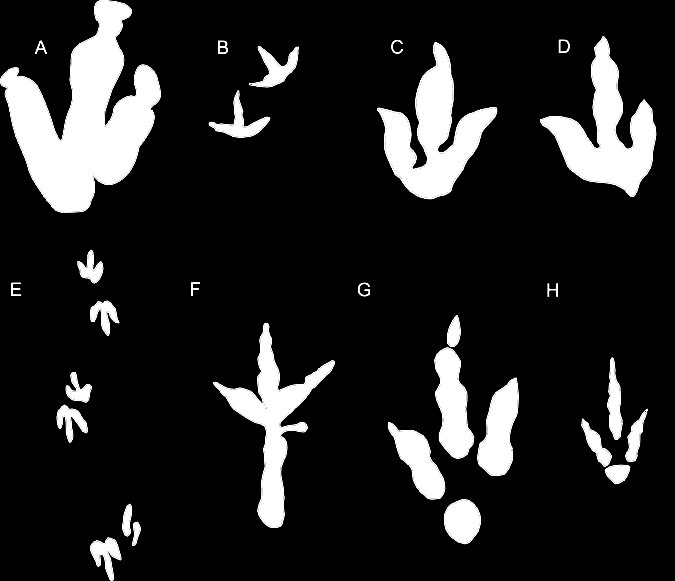 Fig 2 Examples of theropod tracks associated with the various bird legends in China (not to scale). 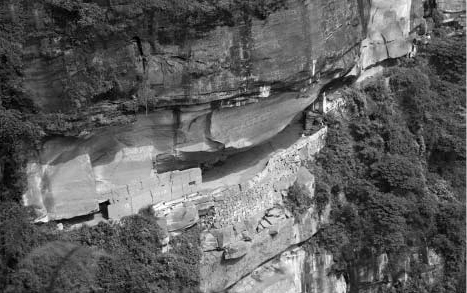 Fig 3 Lianhua Baozhai footprint site and rock building on an eroded surface cut into the cliff face. 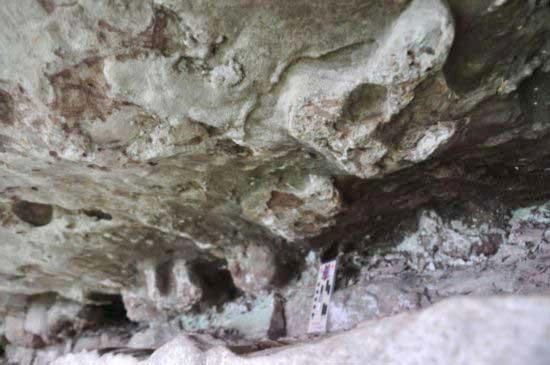 Fig 5 Lotus petal shaped hadrosaur tracks on the overhang at Lianhua Baozhai. Fig 6 Sauropod tracks posing as a lucky rhinoceros trackway. However, fossil footprint folklore is not restricted to China --- there is a rich tradition from around the world (4). One of the most interesting comes from the coast of Portugal and involves, again, sauropod footprints. Fig 7 The Church of Nossa Senhora da Mua at the cliff's edge. At Cabo Espichel steeply dipping rocks of Late Jurassic and Early Cretaceous age rise from the sea to form tall cliffs hundreds of feet high along the small bay of Lagosterios. 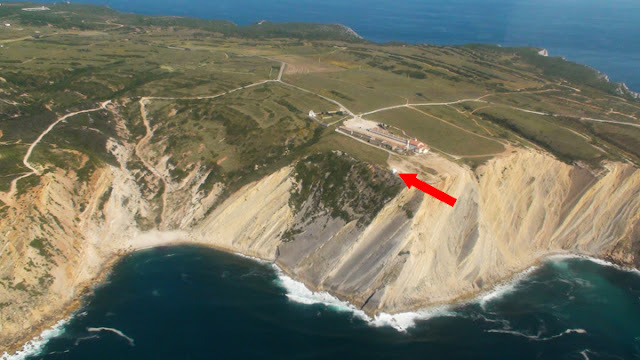 On the top of the cliffs is the Sanctuary of Our Lady of Cape Espichel which dates back to the 15th century. 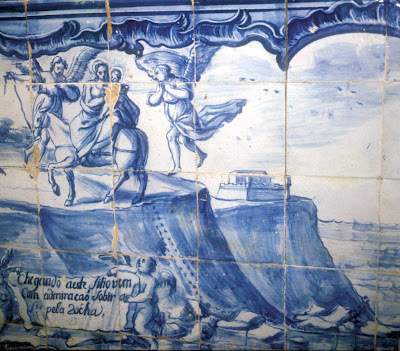 Of most interest to our present story is the Memory Heritage or Church of Nossa Senhora da Mua (Our Lady of the Mule), a small building located away from the rest the Sanctuary at the very edge of the cliff. Fig 8. The steeply dipping dinosaur track layers at Cabo Espichel. Arrow point to location of the small white Church of Nossa Senhora da Mua perched precariously at the edge of the cliff. 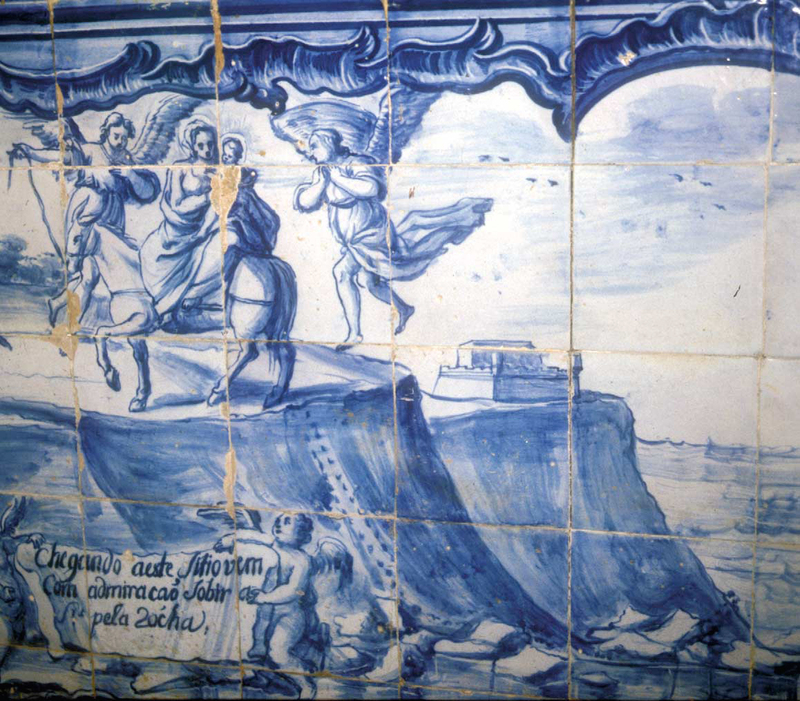 Fig 9 Tile inside Church of Nossa Senhora da Mua showing the Virgin Mary on a mule and two angels at the top of cliffs at Lagosterios Bay. Directly behind the mule's back legs you can see the two rows of mule, er...sauropod, tracks on the steep cliff walls. On the cliffs of Lagosterios forty sauropod trackways occur at eight different levels. The sauropod tracks, known in the area as far back as the 13th century, are large and quite visible even from a great distance. 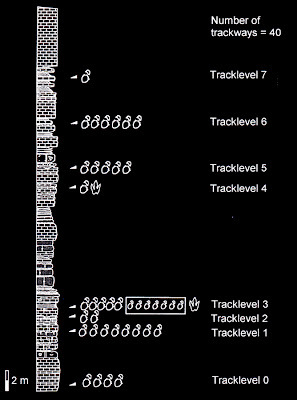 Fig 10 Stratigraphic column for Cabo Espeichel, showing the positions of the eight sauropod track bearing horizons. Although the setting is magnificent, the height of the exposures and the tilt of the beds making accessing and studying the tracks difficult and dangerous. Martin Lockely and his colleagues used ropes, climbing equipment, and bolts to study and map these sites in detail in the mid-1990s (7, 8). One of the track horizons at Cabo Espichel (level 3) provides evidence of social behavior in sauropods. Here one can see the footprints of seven subadult dinosaurs, all about the same size, traveling close together in the same direction, and evenly spaced. The details of track morphology clearly show that they were made by sauropods and not a small herd of celestial mules. 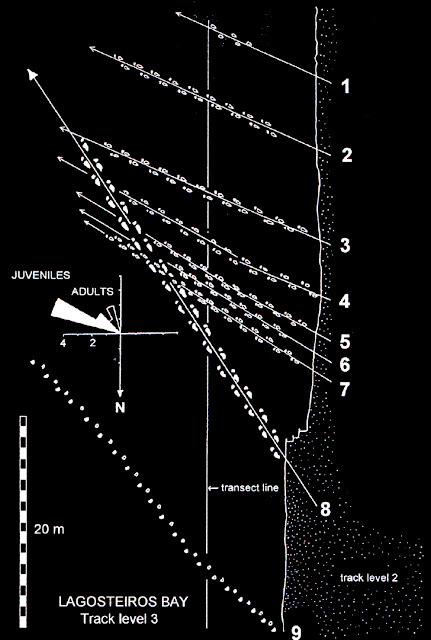 Figure 11 Map of track level 3 at Cabo Espichel showing the trackways made by a group of seven juvenile sauropods traveling together. Tracks 8 and 9 are from adults crossing the area earlier. Fig 12. 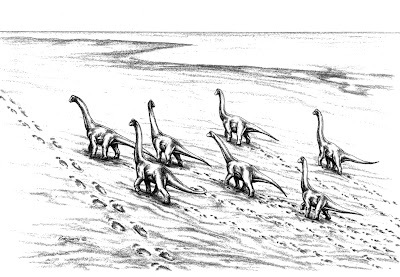 Reconstruction of the juvenile sauropod crossing recorded in level 3 at Cabo Espichel. Note larger adult sauropod trackway already present as the herd crosses the area. 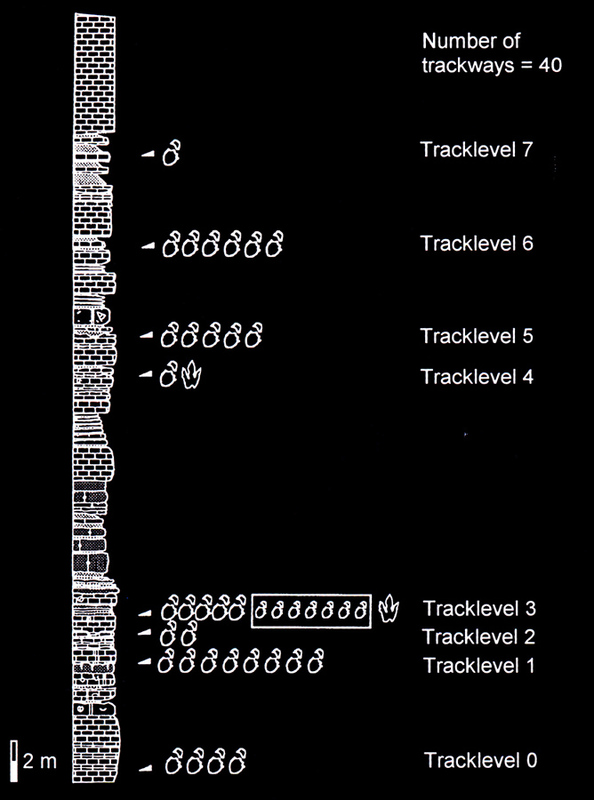 That is trackway 8 in fig 11. Fig 13 Edward Hitchcock, the father of the scientific study of dinosaur tracks. 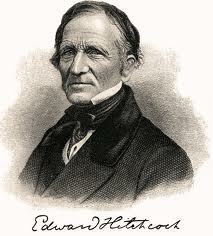 Although fossil tracks have long been recognized as tracks of some sort, the serious scientific study of dinosaur tracks did not begin until the early 19th century when Congregationalist Minister and geologist Edwin H. Hitchcock (1793-1864) began collecting and describing fossil tracks from the Late Triassic and Early Jurassic rocks of the Connecticut River Valley. Hitchcock amassed an immense and diverse collection of fossil footprints that became part of the museum collections at Amherst University and some of it is still on exhibit today. 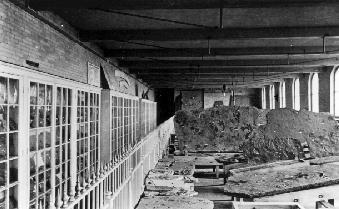 Fig 14 Part of Hitchcock's immense dinosaur track collection as exhibited in the Amherst museum in the 19th century. His studies spanned several decades and resulted in three book-length monographs and numerous scientific papers (9, 10, 11). Ironically, when Hitchcock began his studies dinosaurs were not even known to exist. Faced with peculiar tracks, many of which were three toed, he made careful study of foot structure in many different terrestrial vertebrates. After making these comparison Hitchcock reached the conclusion that the tracks were made by (you guessed it) giant birds! (12) Sadly, he never recognized the dinosaurian nature of his discoveries. (1) Sarjeant, W.A.S. 1997. The Earliest Discoveries. in: Farlow, J.O. and Brett-Surman, M.K. (eds.) The Complete Dinosaur. Indiana Univeristy Press: 3-5. (4) Mayor, A. and Sarjeant, W.A.S. 2001. The folklore of footprints in stone: from Classical Antiquity to the Present. Ichnos 82: 143-163. (5) Antunes, M.T. 1976. Dinosauros eocretacicos de Lagosteieros. Lisboa: Universidad de Lisboa. (7) Lockley, M.G., Meyer, C.A., and Santos, V.F.d. 1994. Trackway evidence for a herd of juvenile sauropods from the Late Jurassic of Portugal. Gaia 10: 27-25. (8) Lockley, M. and Meyer, C. 2000. Dinosaur Tracks and Other Fossil Footprints of Europe. Columbia University Press, N.Y.: 323 pages. (9) Hitchcock, E. 1848. An attempt to discriminate and describe the animals that made the fossil footmarks of the United States, and especially of New England. American Academy of Arts & Sciences Memoir (n.s.) 3:129-256. (10) Hitchcock, E. 1858. Ichnology of New England: A Report on the Sandstone of the Connecticut Valley, especially its Fossil Footmarks. Commonwealth of Massachusetts: 220 pp. MAYBE THEY ARE DUMBER THAN A FIFTH GRADER?